Many of you familiar with our website will have read Olivier Le Floch’s Newsletters, chronicling the life and times of the American 367th Fighter Group, in WWII, who were based at Stoney Cross and Ibsley, between April and July 1944. Olivier is active in searching out information and crash sites in France and in making contact with living relatives of the Group’s pilots in the USA. He has kindly sent us the report below, about a recent ceremony in France honouring the pilots, held in July. (His report is supplemented by details from the Group’s history, ‘The Dynamite Gang’ by Richard Groh – ed. Henry Goodall) On June 17, 1944, the US 9th Air Force’s 367th Fighter Group launched aircraft from all three squadrons of single seat, twin engined, twin tailed fighter-bomber P-38J Lightning, a few minutes apart, from their Stoney Cross base in the Southampton area, in the south of England. The stakes were high, when all three squadrons were assigned to the same mission. Fifty-two pilots left to bomb different targets in the area of Dreux, Evreux and Epernon. The targets are railway lines, railway bridges and yards. Since the Allied landings in Normandy had commenced only 11 days earlier, the attack on these targets was part of the plan to prevent German reinforcements and equipment from being sent to the front. However, the mission was unsuccessful, as the Group’s history, ‘The Dynamite Gang’, records, and many aircraft failed to reach their objectives. Flying beneath a 3000 foot overcast, the airmen of the 367th Fighter Group were suddenly attacked by eight German Messerschmitt bf109 fighters in the vicinity of Châteauneuf-en-Thymerais, Maillebois and Dampierre-sur-Blevy, 55 miles west south west of Paris. The experienced Germans made one pass before climbing into the cloud to repeat their attack. In the confusion, the inexperienced American pilots jettisoned their bombs and some broke away from the formation. Leading the 393rd Fighter Squadron, Captain Joe Griffin engaged in a wild chase with a bf109 at tree top height, eventually driving the German into an even tighter turn, in which he stalled and spun in. Joe made a pass over the crashed bf109 but saw no signs of life. He had not fired a shot at his adversary, but had simply outflown him. In the ensuing mêlée, Lieutenant Earl Peters of 393rd Fighter Squadron managed to shot down one of the enemy fighters. Unfortunately, he was himself shot down a short time later, having been seen by the other pilots with an engine streaming smoke. His plane crashed landed on the town of Maillebois. Another pilot of the same squadron, Lieutenant George White, was also shot down in flames towards Dampierre-sur-Avre. In his attempts to support the pilots already engaged in this dogfight, Lieutenant Henry Gillespie of the 392nd Fighter Squadron, who had been flying as top cover for the Group, led his flight down and dived into the battle, but was swiftly shot down. He crashed landed with his Lightning in the town of Dampierre-sur-Blevy, but was killed in the impact. The Americans shot down two other German fighters before the end of the fight. The final score was ‘a score draw’, three planes lost on each side. This dogfight was the first true aerial combat for the 367th Fighter Group. The Americans considered that the loss of three of theirs for three Germans was a terrible price to pay. However, the engagement showed that the Group could hold their own in combat with the much more experienced Luftwaffe airmen, but that there was a lot of room for improvement. It is sobering to recall that the Group lost a further nine pilots over the next five days, all but one on June 22nd, due to ground fire. This amounted to ten per cent of the ninety lost in total, during the whole of the Group’s year in Europe. Having bombed the Cherbourg area with relative impunity between June 17th and 22nd, when the worst summer storm in 40 years lashed the Normandy coast, destroying the American ‘Mulberry’ harbour beyond repair, Colonel Charles Young led the Group at low level into the same area on 22nd June. The defenders threw up a devastating wall of flak. Out of the seventeen 392nd Fighter Squadron aircraft led by Major ‘Buck’ Rogers on the mission, only seven emerged undamaged. Lieutenant Delbert Smith’s aircraft was badly hit; he managed to make it back to one of the Allied Advanced Landing Grounds, recently established near the Normandy coast. Twisting and turning at very low level, to avoid the flak, Lieutenant Eugene Fleming “flew full bore into a tree”. With both engine intakes clogged with leaves and branches, he was forced to fly home on alternate engines, turning them on and off to avoid overheating. A long lonely flight across the Channel, after which he landed back successfully at Stoney Cross. Lieutenants Earl Peters and Henry Gillespie were subsequently buried next to each other in the local cemetery of Dampierre-sur-Blevy on June 21st, 1944. Their bodies were relocated in 1946 to the Blosville Provisional US Military Cemetery near Carentan in Normandy before being finally buried in the American Cemetery of Saint-Laurent-sur-Mer, which is today the permanent American Battle Monuments Commission Cemetery at Colleville-sur-Mer, which lies on the bluffs above the WWII D-Day Omaha Beach landing site. Lieutenant Earl Peters was from San Diego and Lieutenant Henry Gillespie was from El Paso, Texas. Lieutenant George White’s body was moved to the temporary cemetery of Saint-André de l’Eure before being buried in the Saint-Laurent-sur-Mer cemetery. Lieutenant White was from Philadelphia. In June 2004, the French ‘Forced Landing’ association helped to organise a ceremony in honour of Lieutenant George White. A plaque in his honour was inaugurated by his wife, Mickey. 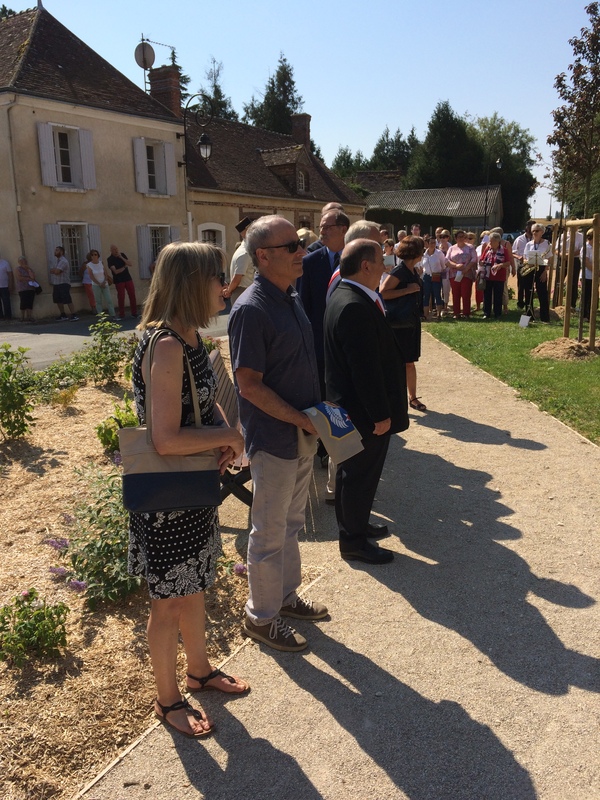 This year, on July 7th 2018, the French ‘Forced Landing’ Association also helped to organise a ceremony to honour Lieutenants Earl Peters and Henry Gillespie. A plaque was also inaugurated. It was unveiled by Earl Peters, the nephew of Lieutenant Peters. Earl and his wife Karen made the trip from northern California to attend the dedication. 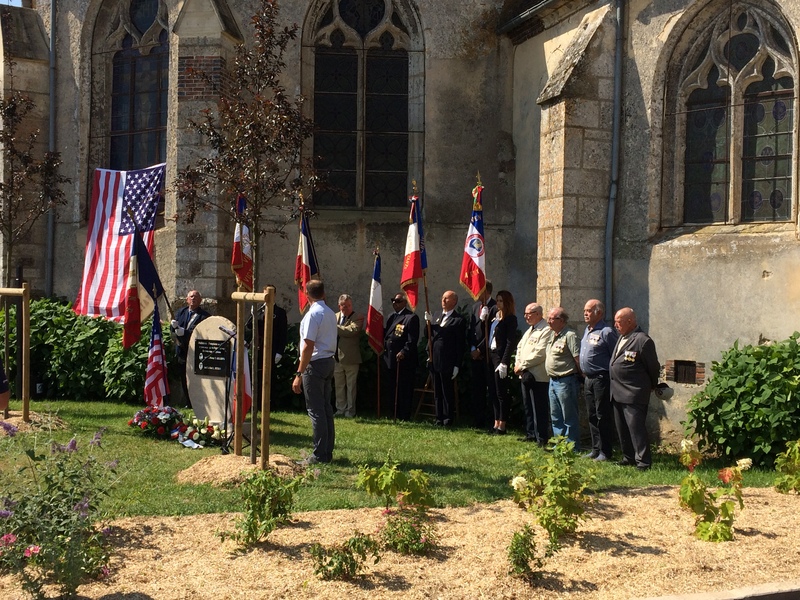 The French veterans of the area attended the ceremony, holding the French flag. After the ceremony Earl and Karen were taken to the cemetery where the two pilots were initially buried and next to Lieutenant Peters’ crash site. Credit: Olivier Le Floch, with additional information from ‘The Dynamite Gang’ – Richard Groh ISBN 0-8168-9770-0. 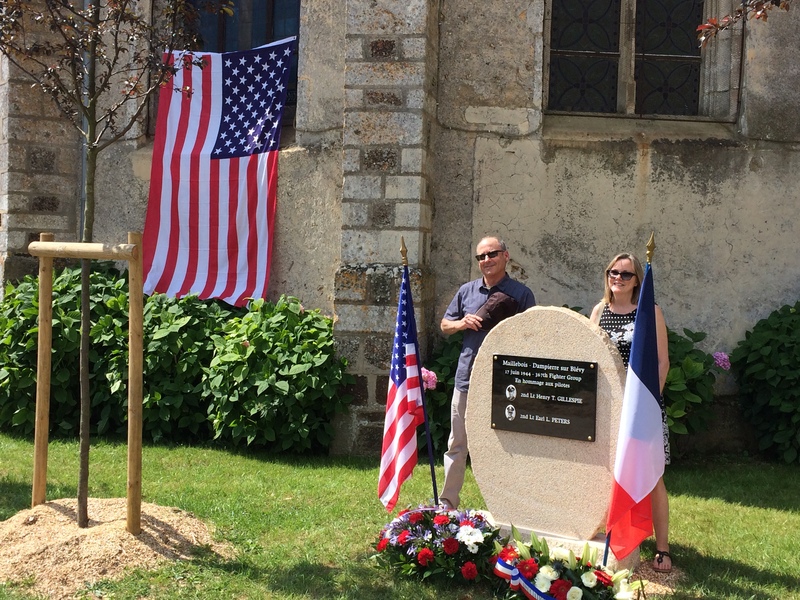 Pictures: Earl and Karen Peters during the ceremony, the Veterans during the speeches, Earl and Karen Peters with the plaque inaugurated on July 7th 2018. 1 Response to New Memorial to Stoney Cross pilots unveiled in France. Thanks – link posted on facebook. Philip.